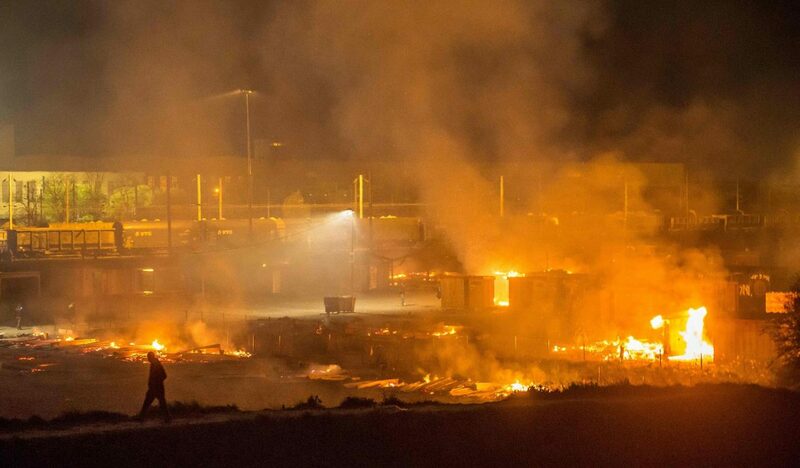 Last night the camp at Grande Synthe was destroyed by a terrible fire. Volunteers have been working tirelessly through the night to help local officials get most of the 1,500 refugees to three gymnasiums, so for the moment at least they are warm and dry with access to showers and toilets. However we do not yet know how the French government plan to re house these people. The local mayor has said that the camp will not be rebuilt. We do know that less than 1500 people were transferred. Some spent the night around the town or the port and some seem to have vanished or run away. Last night we provided three van loads of water and blankets and today we will be taking ready to eat food parcels and more emergency supplies. The fires followed some fighting in the camp earlier in the day. Due to severe overcrowding and terrible living conditions tensions in the camp are high and day to day life is incredibly difficult. We have the utmost sympathy for those trying to survive under these heartbreaking pressures. To help with our emergency appeal to assist those who lost everything in the fire please go to www.care4calais.org/donate. We will keep you updated as the situation develops. Read the article about the fire on the Guardian website.